Let’s assume that every dentist in Columbia, SC considers you the ideal patient. You floss daily. You visit regularly for checkups. You brush your teeth multiple times per day. Outstanding. This automatically equates to your being an expert at brushing your teeth, right? Not so fast. 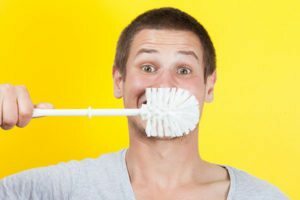 If you’re like most people, you’re still probably guilty of committing several common mistakes when brushing your teeth. By avoiding these 10 most common toothbrushing mistakes, you’ll get the most out of the time you spend caring for your teeth. And we can all agree that healthy teeth create a beautiful smile, so let’s dive in. Use a properly sized toothbrush for your mouth. When shopping for one, match the size of its head to your mouth in such a way that it reaches every square inch, including behind your back teeth. You should never have to strain to clean every tooth. If you are, the head of your toothbrush is probably too big. Some toothbrushes come with straight bristles, while others are angled. Some are a combination. Angled is generally the best, but more importantly you should avoid hard bristled brushes. Hard bristles can erode your dental enamel, irritate your gums, and cause recession. Always use a soft bristled toothbrush! Every dentist in Columbia, SC will agree — you should brush at least twice a day and preferably three. Also, longer periods of time between brushes allow more time for bacteria to multiply. This leads to a plaque buildup as well as exposure to the acids bacteria produce. Frequent brushing removes plaque and neutralizes the pH of your mouth, keeping your teeth clean and healthy. While frequent brushing is crucial, brushing too frequently can harm your teeth. Brushing more than four times a day can cause recession of the gum line and the hastened erosion of dental enamel. This can expose your tooth roots and the softer, more vulnerable dentin underneath the enamel, which can lead to cavities and tooth decay. Align the bristles at a 45 degree angle to your gum line and brush with short, soft strokes. Long, vigorous strokes can irritate your gums and cause abrasion. Brush circularly or vertically, not horizontally. Don’t neglect to brush the inner, outer and top tooth surfaces as well as your tongue. Your tongue is just as prone to accumulating plaque as your teeth and gums. Every dentist in Columbia, SC is human just like you, and as such we tend to be creatures of habit. It’s only normal to start brushing at a particular point in our mouths. However, this is bad because we tend to get lazy and neglect other areas. Starting in a different location each time ensures that all areas of your mouth get an equal cleaning. It’s important to spend as much time cleaning the inner surfaces as the outer ones. Although people only see the outer surfaces when you smile, neglecting the inner surfaces is counter-productive to good dental health. Neglect of your inner teeth will be evident to your dentist in Columbia, SC from the amount of plaque that builds up between visits. Rinse your toothbrush thoroughly after every use to avoid leaving bacteria and food debris on the bristles. If not, you may transfer all that bacteria back into your mouth the next time you brush. Also, replace your toothbrush after a bout of flu or any other viral infection. Every dentist in Columbia, SC (especially us) will advise you of this one: Never leave your toothbrush lying in a puddle of moisture because a moisture allows bacteria to multiply. This is why toothbrush caps are a bad idea, even though they’re supposed to keep your brush hygienic. After brushing, shake off any excess water and leave it to dry, preferably standing up. Change your toothbrush every three to four months. The bristles, which should always be straight, will indicate when it’s time. Once they start bending and becoming frayed, it’s time to purchase another one. If your bristles tend to fray quickly, you’re probably brushing too hard and should ease up on the pressure. Frequent and thorough brushing is integral to maintaining a high standard of oral health. Avoidance of these 10 mistakes is not only a good idea… it’ll put a happy smile on the face of your dentist in Columbia, SC.